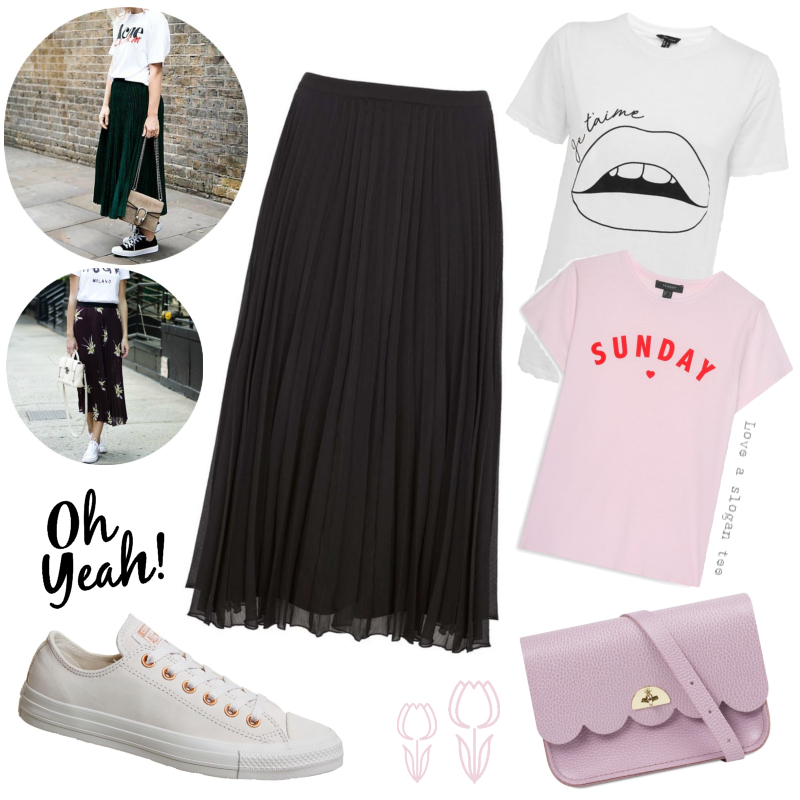 So far this season the stand out trend for me has to be the pleated midi skirt - such a versatile piece that can be worn now or layered up when the weather turns. Today I wanted to share three ways I would style this gorgeous black chiffon skirt from Mint Velvet. As I have said before, I am more Primark than Prada, so I have tried to include a variety of brands and price points, channeling the best way to put an outfit together (more about the High & Low method here...). So my first outfit is an easy everyday look. Styling the skirt with a basic slogan tee, Converse trainers and a cute pastel cross-body bag. A perfect look for shopping, or a day out with the family but would also be great for a casual work environment, maybe dress down Fridays. Next up something for those hot summer days - teaming a strappy mustard cami, with an on-trend round straw bag (IT accessory for the summer), simple tan leather slides and a pop of print with this cute tropical headband. Finally something for those cooler days. Embracing THE trend of AW18, leopard print with these statement ankle boots - I love a midi skirt with ankle boots, very chic. Keeping the rest of the outfit simple with a lightweight grey knit tucked in, a biker jacket thrown over the top and finished off with a classic black fedora. So which is your favourite look? or do you have an alternative combination to share?